Being a film adaptation junkie is hard on the heart. You fall in love so fast, so hard and then all too often you end up downtrodden and sobbing into your pillow. It's all about the disappointment. Perhaps this sounds too melodramatic for a little innocent movie viewing but Cinecultist has been feeling very emotional since reading and then watching Everything Is Illuminated. We loved the book. We loathed the movie. The tears are falling fast and furious onto the keyboard even as we type. 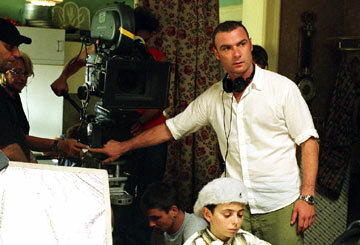 Perhaps we had unfairly high expectations because of the director, first time behind the camera but long time actor Liev Schreiber. Seeing him on stage earlier this year in Glengarry Glen Ross and everything we've read about him, he seems like such a bright fellow. Plus, he's got this adorable dog that we saw him using to charm the staff of Shakespeare and Co on Broadway a few years ago, so we know he's sensitive as well. Surely, this combination would result in a movie that's truthful and thoughtful about Jonathan Safran Foer's novel? Unfortunately, this wasn't the case. CC doesn't usually have a problem with the jettison of some of the novel's plot points for the sake of a clean movie narrative. But in Everything Is Illuminated, Schreiber cuts out the entire history and back story of the hero, Jonathan and his family. There's no "why" here and as a result we have no reason to be invested in his search through the Ukraine for his grandfather's shtetl Trachimbrod. Somehow the idea that Jonathan is a collector should be charming but the way that Elijah Wood plays it, all OCD and tidy he merely comes across as creepy and insensitive. Eugene Hutz, the singer from the band Gogol Bordello who plays Jonathan's translator Alex, fares slightly better in terms of making us care for his character but still his depiction lacks depth. Plus, without giving it entirely away, the grandfather's secret we discover is so 180 from what it is in the novel that it almost makes the rest of the plot incomprehensible. Did Liev think we couldn't handle the harsher realization Foer delivers in his book? Or did some unseen studio exec or producer think it had to be dumbed down for the screen? Le sigh. When will they understand that dumbing down is never, ever the answer? It only makes for a much bigger problem.